The chances that future generations will one day colonize the stars have just got higher. The planet lies in the star's 'Goldilocks zone' - the region in space where conditions are neither too hot or too cold for liquid water to form oceans, lakes and rivers. 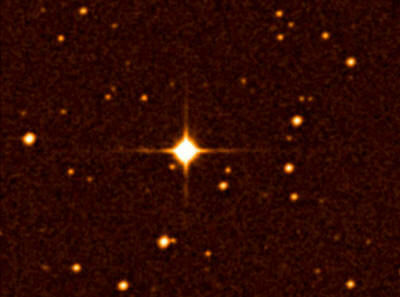 a red dwarf star only 20 light years away from Earth. The four tiny planets in the background are the planets that have already been discovered. The planet also appears to have an atmosphere, a gravity like our own and could well be capable of life. The discovery comes three years after astronomers found a similar, slightly less habitable planet around the same star - described by astronomers as being 'in our backyard' in the Milky Way. Researchers say the findings suggest the universe is teeming with world like our own. 'If these are rare, we shouldn't have found one so quickly and so nearby,' Dr Steven Vogt who led the study at the University of California, Santa Cruz. 'The number of systems with potentially habitable planets is probably on the order of 10 or 20 per cent, and when you multiply that by the hundreds of billions of stars in the Milky Way, that's a large number. Composition: rocky with liquid water and atmosphere. 'Personally, given the ubiquity and propensity of life to flourish wherever it can, I would say that the chances for life on this planet are 100 percent. I have almost no doubt about it'. The planet is so far away, spaceships travelling close to the speed of light would take 20 years to make the journey. If a rocket was one day able to travel at a tenth of the speed of light, it would take 200 years to make the journey. 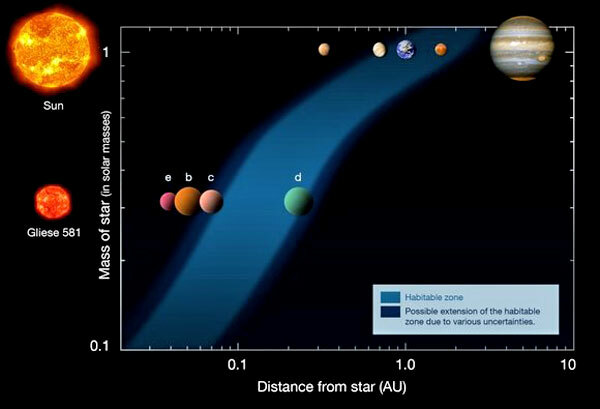 Planets orbiting distant stars are too small to be seen by telescopes. Instead, astronomers look for tell-tale gravitational wobbles in the stars that show a planet is in orbit. The findings come from 11 years of observations at the W.M. Keck Observatory in Hawaii. The planet orbits a small red star called Gliese 581 in the constellation of Libra. The planet, named Gliese-g, is 118,000,000,000,000 miles away - so far away that light from its start takes 20 years to reach the Earth. It takes just 37 days to orbit its sun which means its seasons last for just a few days. One side of the planet always faces its star and basks in perpetual daylight, while the other is in perpetual darkness. The most suitable place for life or future human colonists would be in the 'grey' zone - the band between darkness and light that circles the planet. 'Any emerging life forms would have a wide range of stable climates to choose from and to evolve around, depending on their longitude,' said Dr Vogt who reports the find in the Astrophysical Journal. If Gliese 581-g has a rocky composition similar to the Earth's, its diameter would be about 1.2 to 1.4 times that of the Earth. It's gravity is likely to be similar - allowing a human astronaut to walk on the surface upright without difficulty. 'This planet doesn't have days and nights. Wherever you are on this planet, the sun is in the same position all the time. You have very stable zones where the ecosystem stays the same temperature... basically forever,' Vogt said. 'If life can evolve, it's going to have billions and billions of years to adapt to the surface. Given the ubiquity of water, it seems probable that this thing actually has liquid water. On the surface of the Earth, everywhere you have liquid water you have life,' Vogt added. Astronomers have now found six planets in orbit around Gliese 581 - the most discovered in a planetary system other than our own solar system. Like the solar system, the planets orbiting Gliese 581 have mostly circular orbits. 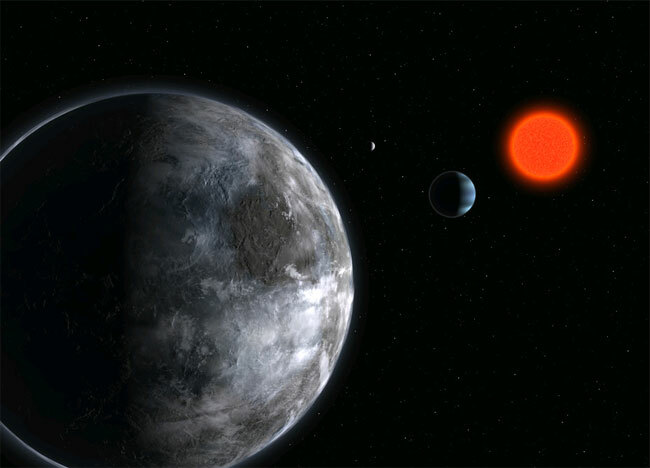 Two of its detected planets have previously been proposed as habitable planets. However they lie at the extremes of the Goldilocks Zone - one on the hot side, the other on the cold side. Gliese 581g, in contrast, lies right in the middle. The star has not been given a proper name. It appears in a catalogue of stars compiled by the German astronomer William Gliese where it has been given the reference number 581. Astronomers name planets found orbiting stars with a letter. The previous five planets found around Gliese 581 were named b to f, making the latest discovery Gliese 581-g.
Its star is a red giant - a massive star near the end of its life. It is too dim to see in the night sky from Earth without a telescope. Astronomers have found nearly 500 exoplanets - or planets outside our own solar system. However, almost all are too big, made of gas instead of rock, too hot or too cold for life as we know it. are compared to those of our own solar system. and the outermost planet is closer to its star than we are to the sun. The 4th planet, G, is a planet that could sustain life. The discovery of Gliese 581 was one of the most exciting moments in extrasolar planetary researcher. 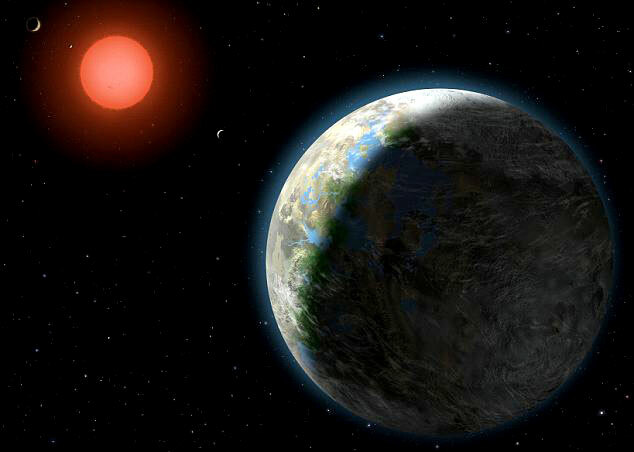 Astronomers found an Earth-massed planet orbiting within the habitable zone of a distant star. This would mean that liquid water could be on its surface - and maybe life. Now there’s even more evidence that Gliese 581 is living up to the speculation. Astronomers have published two independent studies this week, claiming that there are least 2 Earthlike planets orbiting the star within the habitability zone. The first team, led by Franck Selsis, computed the properties of planetary atmospheres at various distances from the star. As we’ve seen with Venus, Earth and Mars in our own Solar System, your distance from the star matters a great deal. Get too close, and the water is vaporized and blown out into space. Get too far away and your carbon dioxide can’t trap in enough heat to keep the planet warm. You want to be just right. Selsis and his team calculated that the inner boundary of this habitable zone (below image) around Gliese 581 should be somewhere between 0.7 and 0.9 astronomical units (an AU is the distance from the Earth to the Sun ≈ 149,597,870.7 kilometers). And the outer zone should be between 1.7 and 2.4 AU. At least one planet orbiting Gliese 581 falls within this range. The second team used a different technique to calculate habitability. They studied a narrower region where Earth-like photosynthesis is possible. For the super-Earths thought to be orbiting Gliese 581, they calculated the sources of atmospheric CO2 (volcanoes and ridges) and then the potential sinks through weathering. If a planet’s too old, if might not be active any more, and wouldn’t release enough CO2 to keep the planet warm. Once again, the age of the planets, and therefore the amount of carbon dioxide, is within this region of habitability. Thanks to this new research, the planets orbiting Gliese 581 are primary targets for future planet hunting observatories, such as ESA’s Darwin and NASA’s Terrestrial Planet Finder. These observatories should be able to directly measure the atmospheres of these planets, and determine if they harbor life. A third paper on the topic has recently been accepted for publication in the journal Astronomy and Astrophysics. In this, another team of researchers have studied the long term orbits of planets going around Gliese 581. Here you want stability, without highly eccentric orbits that might cause extreme warm and glacial eras. 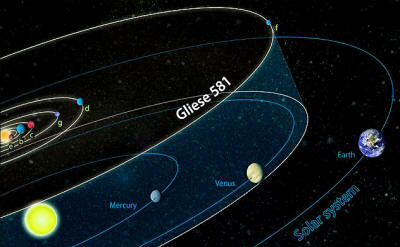 Once again, the planets around Gliese 581 are surprisingly stable. Things are looking really hopeful. Now we just need someone to uncancel the Terrestrial Planet Finder.